Valerie Kasanita Adams was born on October 6th 1984 in Rotorua, New Zealand and was brought up in a Christian background. Her mother Lilika Ngauamo was Tongan and her father Sydney Adams was English born. She also has several brothers that are over 7ft tall. Sadly her mother died when she was 15 years old and her mother inspired her. In 2010 she divorced her husband Bertrand Vili. Valerie was a shy child when she was at school. She was also very tall and good at basketball. Her P.E teacher spotted her talents at high school in Mangere and noticed her good forearm throws. Valerie Adams broke the record for shot put in bare feet in the junior championships. She also won a gold medal at the 2010 Commonwealth Games. In Jamaica she threw a shot put at 17.73m and won silver at the Commonwealth Games. She is currently holding the New Zealand Oceanian, Commonwealth Games and equal World championship records with a personal best throw of 21.24 metres. 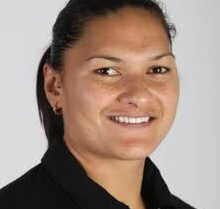 Valerie Adams’s makes New Zealand proud of her achievements. Valerie will make New Zealand proud in the 2012 Olympic games and will win lots of gold medals. I like your report it is very detailed. You have grouped your ideas.Keep up the great work.